Dream Sites (DS1, DS2) are parts factories for machining and assembly at Okuma's corporate headquarters in Japan. DS factories are equipped with many of our own smart machines,*1 an they are the reality of what an Okuma Smart Factory*2 can do. By utilizing IIoT, we can maintain levels of mass production even in small quantities, and thus achieve mass customization. By combining the latest IT and automation systems with "artistic" skills cultivated over a long history, our products are made with high added value. *1. Smart machines are intelligent machine tools that can autonomously judge their own processing conditions, to perform optimal machining. That defines all of the machines equipped with Okuma OSP suite controls. *2. The Okuma Smart Factory is a model of a highly efficient production facility proposed by Okuma for the manufacturing industry. By enhancing factory capabilities to the utmost, highly-mixed production batches with short deliveries is what agile manufacturing requires to cope with changes in demand. In the Okuma DS factories, the production schedules of cutting-edge machines and robots, served by automatic guided vehicle systems (AGVS), are all smoothly interweaved. As a result, it became possible to complete material input to final machining, without human intervention. In addition, logistical automation of each process assured continuous operation 24 hours a day, 7 days a week. To keep our Dream Sites operating at peak utilization rates, we front load as much as possible. Part programming, as well as machine and robot simulations, can be left to a PC in advance to minimize setups in the machine shop. We do take full advantage of IIoT to centrally manage various types of information. By accurately grasping complex process and system operating status, tool information, the location of blanks and finished parts, efficient overall factory control became possible. What's more, accumulating information and repeating the PDCA (plan-do-check-act) cycle allows us to shorten lead times. With the DS2 Smart Factory, a second model of a next-generation factory has been built as part of the ongoing "collaborative creation" between Okuma and Hitachi, to achieve factory-wide optimization at highly efficient production levels to deliver mass customization. Our DS factories effectively streamline work flows from initial material input to final product shipment. With a rationally arranged factory layout, we are producing a wide variety of products with speed and efficiency. An automated chip collection system is installed in the machine shop. Chips are suctioned out from each piece of equipment and air conveyed to the outside in a collection pipe. This keeps the factory interior clean. Other strategies to maintain a clean environment inside the factory include the use of full enclosure shielding and mist collectors on double-column machining centers so that particulates produced during machining are not discharged outside the machines. DS1 has about 500 solar panels installed on its walls and 3,800 solar panels on its roof. These panels generate roughly 1,040 kW, which is equivalent to the energy consumed by 260 ordinary homes. DS2 uses geothermal energy for high-efficiency heating and cooling in the plant. Energy efficiency is also promoted with the use of solar panels with high insulating properties on exterior walls, LED lighting, air compressor invertor controls, electric heat pumps and other equipment. This has so far resulted in reducing energy costs by 30 percent compared with previous levels. DS1 began operation at the World Headquarters Plant in 2013, producing multitasking machines, medium-sized and large lathes, and vertical lathes. 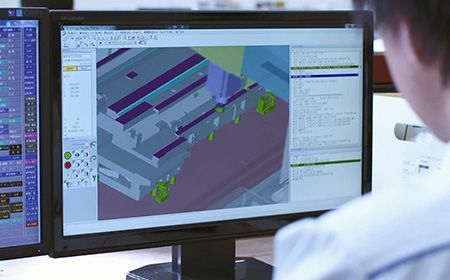 DS1 is a self-contained start-to-finish production factory consisting of a machine shop and an assembly shop, handling all processes from materials input to shipment. DS2 is a self-contained start-to-finish production factory of small and medium-sized lathes and grinders. As the first step, operation of a machine shop has started in 2017. DS factories are equipped with many of our own smart machines, and they are the reality of what an Okuma Smart Factory can do.